Andre Huff is an Assistant Planner who provides support on a range of project types including circulation plans, parking studies and traffic impact analyses. Andre Huff graduated from California Polytechnic State University, San Luis Obispo in 2017 with dual M.S. degrees in City and Regional Planning and Transportation Engineering. He also holds a B.S. degree in Community and Regional Development from UC Davis. 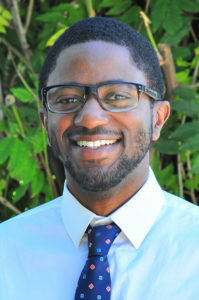 After graduating from UC Davis, Andre spent time working at an environmental law firm based in the San Francisco Bay Area where he gained extensive knowledge about planning in California, specifically the environmental review process. During graduate school, Andre interned within the planning department at the Caltrans District 5 headquarters in San Luis Obispo, and also with a private traffic engineering consulting firm in the San Francisco Bay Area. While at Cal Poly he was involved with the student chapters of both APA and ITE and plans to continue his involvement as a working professional. Additionally, Andre led the GIS and mapping efforts for his culminating background report and general plan projects at Cal Poly. Andre decided to choose a career involving a healthy combination of planning and engineering as he felt it was the most impactful method to move strategic planning efforts forward both in the short term and long range.